Uncertainty in a Living System -- In the 20th century, the study of quantum mechanics revealed that the act of observing an object changes the behavior of the observed. This uncertainty principle posits that there is a fundamental limit to what one can know about a system, because the act of measuring introduces uncertainty into the actions of the object being measured. 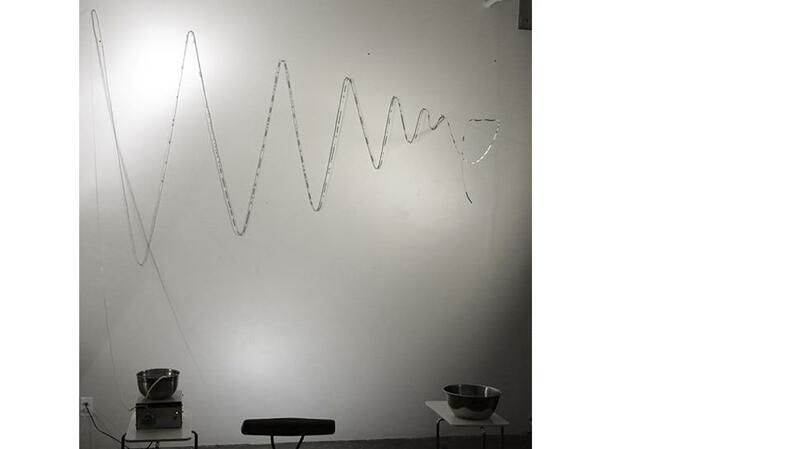 In this context, the Transflux exhibition offers an environment and experience that expands upon this notion of interconnectedness and is based on the tight connections between the viewer and the artists’ construct. Transflux is a multi-media interactive exhibition where the artists transform the Front Door Gallery into a living, breathing organism and symbiotic ecosystem. Through the exploration of our inner and outer world, the artists demonstrate the patterns and forms within life that shape who we are and where we come from. The use of natural and electro-mechanical systems, formed from ancient and contemporary modes of art and technology, creates an imitation of life — biomimicry — within a contained space, where the visitor can realize the impact of their individual actions upon the whole environment. This deep, firsthand awareness of one’s influence upon their surroundings alters the individual. As soon as the visitor enters the space, they become an invaluable part of the environment, producing reactive environmental responses and adaptations based on their own personal choices. The integrated systems constantly evolve due to hyper-sensitive sensors and data systems that react to influences from both inside and outside the space, creating an individualized experience for every visitor. "i and i" is a performance piece co-created by Tina Matthews and eve Warnock incorporating unique sound, movement, and costume. The piece will premiere at the Yerba Buena Center for the Arts in conjunction with the Transflux gallery opening on January 30th 2015 at 7pm. The vocalizations and soundscape will be amplified throughout the gallery. The Room for Big Ideas series, held in YBCA's free and open project space, engages our audiences through critical inquiry, context, and socially engaged arts. It is where art and ideas intersect and are shared through interaction, experimentation, and engagement. The Room for Big Ideas series hosts multi-media, immersive, and participatory installations/ residencies, special visual and performative projects, open dialogue, and exchange.